It’s important for leaders to evaluate their plans and determine if they’re reaching their goals. Oracle S&OP Cloud has configurable graphical dashboards, detailed reports and layouts that offer different levels of analysis concerning your S&OP processes. The S&OP Cloud make it easy to configure analytics to meet your unique needs, manage exceptions and track how strategies have changed over time. These reports and metrics will be a significant asset to running quick simulations to evaluate new plans and selecting the best one to execute on strategic decisions. For any business, ensuring there’s enough supply to meet customer demand is an art form. Too much inventory can waste money, while not enough will frustrate consumers and create major rushes to expedite incoming orders. With S&OP Cloud, planners can run supply simulations and create strategies around accommodating changes in demand and the impact of those fluctuations. This is a challenging task with legacy solutions, but S&OP Cloud makes it possible to predict outcomes and plan for all eventualities. 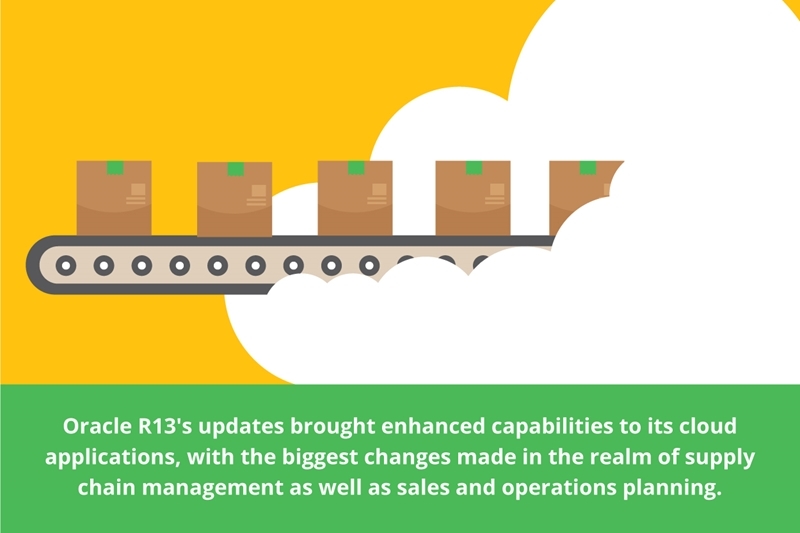 Oracle R13 brought major benefits to cloud operations. Within legacy solutions, it can be difficult for sales and operations personnel to work together effectively. They might use different programs and terminology, making it hard to create cohesive strategies. If anything goes wrong along the way, a lack of connection can make it challenging to tackle the issue appropriately and devise effective ways to ensure similar problems don’t occur in the future. With Oracle’s R13 update, employees can use Oracle Social Networking built into the S&OP Cloud to collaborate and resolve issues effectively. The cloud solution ensures that all users have access to the most current information and can easily look at past strategies to determine the best plan of action. New updates and software should be able to integrate seamlessly with solutions that businesses are currently using. The S&OP Cloud integrates well with Microsoft Excel and other essential existing systems. It offers the ability to transfer planning notes within the supply chain cloud and ensures a more seamless transition. The interoperability will garner more buy-in and make employees feel more comfortable using these solutions. Inspirage is adept at deploying Oracle and other ERP and SCM solutions in 90 days or less. As an Oracle Platinum Partner, we understand how to configure and tailor these systems to your company’s needs. For more information on implementing Oracle’s R13 updates and taking advantage of the newest features, contact us today. Lav Batra is a Solution Director for Business Development and Supply Chain Management at Inspirage. Throughout his career, Lav has been known as a top performing supply chain solution architect and business development resource with proven abilities in Oracle SCM with a focus towards S&OP utilizing Demantra and strategic network optimization, ASCP and production scheduling toolsets, program management, systems implementation and strategy.